Our top-selling trailer seals are simply the best on the market, trusted countless times over to protect important freight, cargo and other valuables. The difference is in their super strong, one-piece plastic construction with a patented locking mechanism. They are designed for superior tamper resistance and durability in all kinds of demanding weather conditions. Choose from a variety of colors marked “SEALED” and numbered consecutively, or let us customize your truck seals to meet your exact needs. When it has to arrive securely by road, rail, air or sea, count on Budco for the right seals to get the job done. 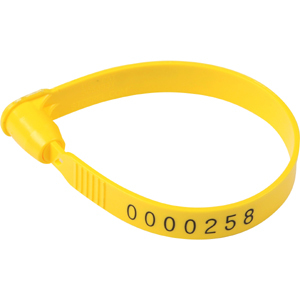 Click to see this and our entire collection of Fixed Length and Plastic Trailer Seals and Security Seals.